The Defense Department’s strategic capabilities office plans to test-fire its hypervelocity projectile in less than a year, Breaking Defense reported Friday. HVP costs approximately $86,000 per round and works to travel up to 5,600 miles per hour to target incoming threats. “That projectile is being designed to engage multiple threats,” Vincent Sabio, HVP program manager at DoD’s SCO, said Thursday at a Center for Strategic and International Studies event. “We need to be able to address (all) types of threats: subsonic, supersonic; sea-skimming, land-hugging; coming in from above and dropping down on top of us,” he added. Sabio said the HVP round uses the U.S. Marine Corps’ ground/air task oriented radar system for long-range surveillance operations and a radar interferometer designed to provide a 360-degree fire control capability. 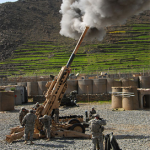 The projectile can be fired from the U.S. Army’s 155 mm howitzers and the U.S. Navy’s deck guns. Sabio noted that Army howitzers’ barrel and muzzle brake components would require modifications to facilitate HVP launches.